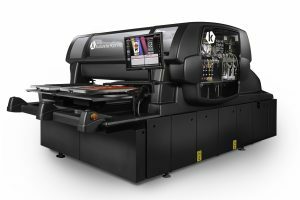 Kornit Digital Ltd. unveiled the Kornit NeoPoly Technology for high-quality printing on polyester. Currently polyester is printed predominantly by analog solutions, which creates major technological, cost and sustainability challenges. With a new process and ink set implemented in the Kornit NeoPigmentTM process you can print digital now on polyester without compromising on design, run size, substrate or labor. Polyester is the second largest category in the overall T-shirt market, it is key in the sport segment, and is growing in the athleisure and functional apparel segments. The Kornit Neo Poly Technology is achieved by an innovative ink set and a physical and chemical process specifically developed for low temperature curing, and polyester enhancing functionalities developed to maintain fabric characteristics and provide superior fastness. This unique process prevents dye migration on polyester. The inks are Oeko-Tex and Eco-Passport certified and do not contain PVCs or other toxic ingredients. The first system equipped with the Kornit NeoPoly Technology is the new Kornit Avalanche Poly Pro, a member of Kornit’s world-class reliable, highly productive industrial platform. The single-step Poly Pro is enabling easy and cost effective short-runs and on-demand printing on polyester garments. The new Kornit Avalanche Poly Pro has been unveiled at Kornit’s Discover events on April 3-4, in the New York Metropolitan area, on April 11-12, in Düsseldorf, Germany and April 15-17, in Hong Kong. The system will also be publicly shown and demonstrated at Fespa Munich, CITPE China and ITMA Barcelona.